Pick a day when you know you're free and won't be distracted by other things. Choosing a day when you know you have to meet other people or attend an event is a poor choice as you're just setting yourself up for failure. Buy your own juicer. Many companies offer ready made juices for juice cleanses. I had a quick look and in England the average cost of a day's worth of ready made juice is the price of my juicer (about 65 pounds). This is the juicer I use; Super efficient and cleaning it is a doddle. Plus when you've been delivered 3 days worth of juices in one go then it's hardly fresh. Juices should be consumed as soon as they're made as that's when they're the most potent. Plan your menu in advance. Write down your ingredients list and do your shop accordingly. Things will quickly go downhill if you are missing a vital ingredient for your juice. Are you a peckish person? Do you have lots of snacks? What we eat, how much we eat and when we eat is often driven by emotion rather than actual hunger. Bear that in mind, so you can override the "hunger" in your brain when it hits. This is when you feel that you want to eat but you know you're not really hungry. Decide whether you're going to juice for the whole day or whether you'll allow yourself a meal. If you're used to eating 3/4 meals plus snacks daily then it might be best if you choose to juice for breakfast/lunch and allow yourself a meal for the evening. Are you going to allow yourself "clean" snacks? I find it easier to plan in a meal/snacks should I need it. This allows you a margin of safety and you won't feel like you failed or guilty if you cave in. If you choose to include a meal opt for something light and fresh. So something like plenty of salads and some grilled proteins with veggies. Or salad and a soup. Avoid choosing processed foods as that will just make you feel sluggish again. You don't have to juice/detox for a whole day. Start by introducing a juice in the morning and then clean eating for the rest of the day. You're more likely to succeed if you have goals which are achievable. Then you can build up on that as you progress. Drink plenty of water to stay hydrated. Water is such a precious gift and we just don't drink enough (I'm super guilty of that, in fact I have only recently started drinking water). Other drinks that are good to drink are anything herbal (non caffeinated). Lemon & ginger tea (delicious) and mint tea are my favourite "teas" to drink. Coconut water is also really hydrating. Have some apple cider vinegar (dilute 1/2 tablespoon with a juice/water as it does taste foul on its own). It's a great digestive tract cleaner, promotes better digestion, beats bloating and encourages growth of friendly bacteria in the gut. Common side effects of detoxing are feeling moody, lethargy, headache, and irritability. If you live with people just warn them in advance. No hard feelings there. 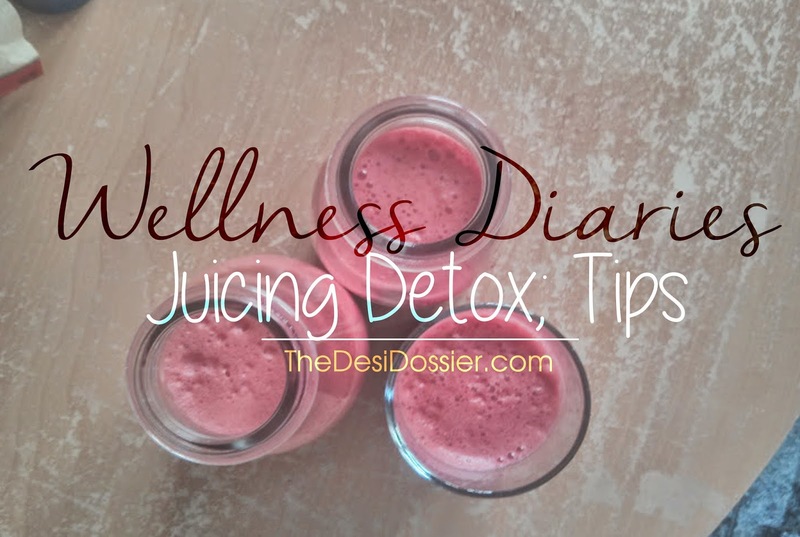 A juice detox will cause stored toxins to start being eliminated. The elimination of toxins can make you feel sick. The levels and amounts of side effects are dependent on each individual. Some people feel none. Others feel lots. You'll also crave a lot of crap. Ignore it. You are stronger than that. Spend the day just relaxing, and doing things you enjoy. If you enjoy reading then pick a book and get lost in it. Do some yoga or light stretches, go for a walk in the park and medidate. Use this time to re-connect with yourself. The mind-body connection is a powerful one and often we're just so busy that we disregard the well-being of our mind. Start the day by body brushing (see post here on how to). It's a very effective and simple step to take which is enhances the detoxing process. Plus it gives you super great skin. End the day by taking a detox bath (click here). Detox baths are amazingly good. You have to try it to know what you've been missing out on. It helps with aching, tight, and sore muscles as well as draws toxins out of your body and helps you sleep better (I am a chronic insomniac, so I know). If you have access to an infra-red sauna, make use of it (I no longer have access to one and boy do I miss it tons). If it's a sunny day then sit out in the sun for half an hour and absorb some vitamin D. Feel the warmth of the sun spreading all over you. Wriggle your toes. I decided to have a juice cleanse day because I was feeling like crap to be honest. I love bread/sugar/fizzy drinks/. Bread makes me really bloated. And I drank too much fizzy drinks. I wanted to get rid of that bloated feeling to feel better so I can kick-start my healthy lifestyle off again (I'd been neglecting my body for a little while). Because I really wanted this and I've done juice cleanses before I knew what I was getting myself into. It's a mindset. You are the products of your thoughts. Remember why you want to do this, and focus on that. Stay motivated. It's hard. If it was easy, everybody would be doing it. You're not everybody. You can do this if you want it. But only if you want it.